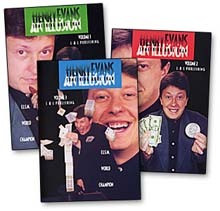 If it’s been a while since you’ve watched a magician perform and have sat there totally clueless, you’ve apparently never seen Henry Evans work. And in this, his first ever video outing, Henry generously parts with the secrets that made him a Gold Medal winner at FISM 2000. First, you’ll be slack jawed at the amazing magic that Henry creates...and then you’ll be thoroughly delighted by how it’s all done-diabolical cleverness rather than knuckle-busting sleight-of-hand. It’s out-of-the-box magical thinking that’s relatively easy to do but guaranteed to mystify and delight even the most jaded magical audiences. Henry will make you fall in love with magic all over again! Modern Times - Henry’s opening effect at FISM. Watch as the case vanishes instantly without a trace, leaving only a deck of cards in the performer’s hands. If that wasn’t enough, a red and blue deck instantly change places! Rising Card - You’ll think you know how this is done when the card rises from a card case the spectator is holding; that is, until all is left for the spectator to examineA! Automatic Queens - Originally a marketed effect. Four signed Queens are lost in the deck and then jump out onto the table apparently of their own volition. 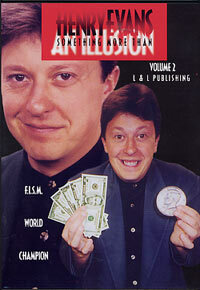 Another miracle straight from Henry’s FISM act! Perfect Control I - A chosen card from one deck is set aside. A second deck is shown to be completely normal and then, instantly, all the cards of one suit are shown to have turned face up in numerical order— well, almost all. The only one missing from the sequence is the same suit and value of the spectator’s selection! Perfect Control II - A deck of cards is shown to be normal. Four cards are randomly selected from a second deck. When the first deck is re-spread, four cards have mysteriously turned over—and are shown to match the selections! 3D Photograph - A whimsical miracle. 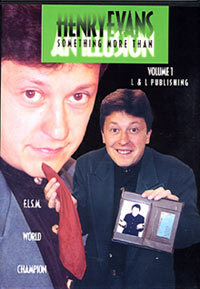 The performer shows a photograph of himself holding a silk handkerchief. The wallet is closed and when it’s reopened, the silk handkerchief has magically materialized and is shown to be now absent from the photo. Cards In Tie - You’ll retire your Card SwordA forever! The performer finds two selected cards by instantly threading them onto his necktie! 2000 Three Card Monte - Another previously marketed effect. Imagine being able to do the cleanest Three Card Monte routine ever—where the spectator is totally convinced they know where the money card is, only to discover that the card has magically changed—and then hand the cards out as souvenirs! 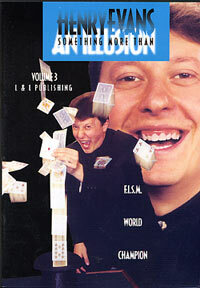 Disappearing Deck - An entire deck of cards disappears from the performer’s hands, leaving only the selected card behind. The balance of the deck is then retrieved from the performer’s inside jacket pocket. Fork and Knife - It’s the classic transposition where a knife wrapped in a handkerchief turns into a fork. Every kid knows this one—except the part where a huge bottle is produced from the handkerchief! Invisible Jumbo Coin - A jumbo coin disappears from the performer’s hands with absolutely no cover and then, just as mysteriously, reappears. A miracle that can be performed in short sleeves! Impossible Penetration - A selected card travels impossibly into the interior of a transparent plastic bag. A Visual magic at its finest! Vacuum Cleaner Card - A silk is “accidentally” sucked up into a mini-vacuum cleaner. A card is selected and the apparently insatiable vacuum removes the ink from its face. When the machine is taken apart, the silk is recovered and shown to now bear the face of the selected card. My Prediction Is Your Card - A jumbo card is freely shown as a prediction. A card is selected and replaced but the performer’s prediction is apparently wrong. All end’s well, though, when the spectator’s selection is shown to have vanished from the deck, only to appear inside (yes, inside!) the jumbo card that was in plain sight throughout. Chinese Miser’s Dream - Chinese coins mysteriously travel and multiply in the performer’s bare hands. As a stunning finale, four more jumbo coins are produced from between two absolutely guileless playing cards. A no-sleeves, jawdropping miracle! Silk Through Transparent Bag - A silk instantly and visibly penetrates a transparent plastic bag tied around the performer’s hand. Time Machine - A silk instantly and visibly vanishes from a drinking glass and, just as mysterAiously, reappears. A visual stunner! Fastest Trip In The World - If you blink, you’ll miss it. A silk vanishes from one hand and instantly travels to the other. Remote Control Deck - A deck of cards is shuffled by a spectator and set aside. A small packet of cards is shown to consist of mixed colors. At the performer’s command, the colors instantly separate in the small packet. The deck is then spread to show that the colors also separated in like fashion. Tribute to Varone - A regular-sized deck is removed from its card case, which magically shrinks to half its previous size. After failing to find a selected card, it’s found folded inside . Card From Top Hat - A great finale for any close-up act. After having a card selected, the deck is placed into a top hat and, upon his command, fly straight up into the air. When the cards settle, the magician is seen to have caught the spectator’s chosen card. Appearing Coins 2 - Another ingenious A and technically easy method of producing five coins.